Mrs. Eleanor Headen Lamy, 68, of Cocoa Beach, Fla., a retired secretary for the Evanston School District 65, died Friday in cocoa Beach. Mrs. Lamy worked for the school board for 21 years. She is survived by three sons, Joseph, Jeffrey, and Jay; on daughter, Joan Emmert; and eight grandchildren. Services for Mrs. Lamy are pending. [S1389] Chicago Tribune, January 8, 1978, page B23, ProQuest Historical Newspapers, Chicago Tribune (1849-1987), accessed February 2011. Death*: Francis died on 20 November 1906 at Chicago, Cook County, Illinois, USA, at age 66. 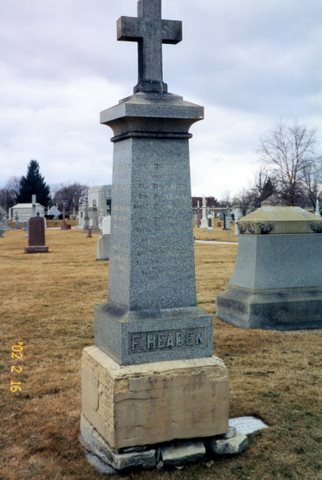 Calvary Cemetery Monument states that Francis Headen died Nov. 20, 1906..
Burial*: His body was interred on 3 December 1906 at Evanston, Cook County, Illinois, USA, at Calvary Cemetery. Chicago Daily News, Saturday, December 1, 1906, Page 15. Headen, Frank, beloved husband of Agnes Headen (nee McCanna). Funeral, Monday, Dec. 3, 9:30 a.m. from his late residence 230 Dearborn Av. to Holy Name Cathedral, where solemn requiem high mass will be celebrated thence by carriages to Calvary. Waukegan papers please copy. Lot 40, Block 10, Section N.
[S276] 1900 US, Illinois, Cook County, Chicago, Washington, DC, ED 717, Page 9B, Vol 51, Ed 717, Sheet 9, Line 92. [S383] Mary Agnes Headen, Illinois Death Certificate. Assignments: St. Laurence for 2 years and 4 months (at the time of the quesionnaire, April 29, 1903), September 15, 1904 assigned as asst. at Presentation - I believe both of these churches were in Chicago, but this is not confirmed. AWOL and presumed dead by archdiocean records, removed from inactive list on July 27, 1960. Listed as absent with leave as early as 1911 in Catholic Directory, until 1938, when he is not mentioned at all. FHL #1548257 - St. Mary's Church baptisms, first 20 pages of film copied..
[S223] Letter, Nancy Post to Elaine Watson, March 28, 1001, Nancy Post wrote to the Chicago Archdiocese to get information on Francis Haydon but his name was spelled Headon. [S223] Letter, Nancy Post to Elaine Watson, March 28, 1001. [S198] Evanston Index, January 18, 1902. [S1279] O'Malia-Connor Marriage License, no. 339588: FamilySearch.org, accessed December 30, 2010. Birth*: Genevive was born at Evanston, Cook County, Illinois, USA, on 17 December 1882. St. Mary's Baptismal Register, page 10..
Baptism: She was baptized at St. Mary's Church, Evanston, Cook County, Illinois, USA, on 24 December 1882. Religion: Roman Catholic. St. Mary's Baptismal Register, page 10. Godparents: Francis and Mary McCanna..
Death*: George died on 22 August 1929 at Chicago, Cook County, Illinois, USA, at age 48. Illinois Statewide Death Index, 1916-1950. Certificate #6024519. Burial*: His body was interred on 24 August 1929 at Evanston, Cook County, Illinois, USA, at Calvary Cemetery. Grave card, Francis Headen purchased on January 18, 1870. Chicago Daily News, Friday, August 23, 1929, Page 43. Headen - George P. Headen dearly beloved husband of Esther, found father of Patricia and Russell, brother of John J., Francis M., Mary A., Leo B., Mabel Devlin, Katherine Debicke and Nan Garver. Funeral, Saturday at 9:30 a.m. from late residence 3236 Warner Av. to Our Lady of Mercy Church; internment Calvary. For information call Merrimac 9186 or 9187. [S1421] Cook County, Illinois Marriage Index, 1871-1920, online Ancestry.com, Headen - Ludden marriage record, FHL MF# 1030444. [S382] George Headen, Headen, George - Death Cert. Marriage*: He married Guila Ethel Waddell. 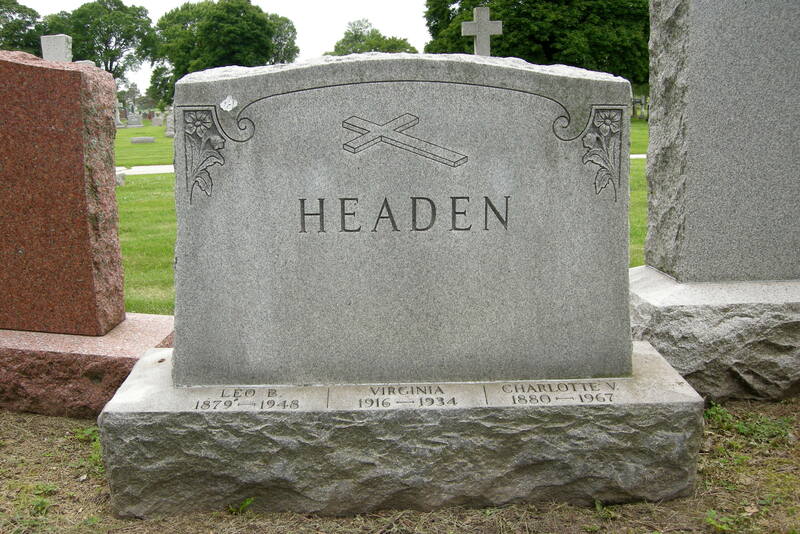 See John J. Headon's death notice, 1937..
John J. Headen, whose home was at 1637 Chicago avenue, died Tuesday, July 13, at St. Francis hospital, at the age of 66. He suffered a stoke about nine months ago and was taken to the hospital just a week before his death. Mr. Headen was born in Evanston and in his early youth lived at 1327 Lake street. His mother was a member of the Connor family, early Evanstonians, who settled here in 1855. Surviving are his wife, Ethel Gulia Headen: his daughter, Mrs. Mary Headen McDermot of Chicago; a brother Leo B. Headen, and three sisters, Mrs. Mabel Devlin, Mrs. Cahterine Debicke and Mrs. Nan Garver, all of Chicago. Funeral services were held last Thursday morning at St. Mary's church, the requiem mass being sung by the Rev. Joseph J. McGuire. Burial was at Calvery cemetery. Headen - John J. Headen, husband of Ethel, father of Mrs. Mary McDermot, brother of Leo, Mrs. Mabel Devlin, Mrs. Catherine Debicke and Mrs. Nan Garver. Funeral Thursday, 9:30 a.m. from Chapel 1573 Maple Av. Evanston to St. Mary's church. Burial at Calvary. Burial*: His body was interred on 15 July 1937 at Evanston, Cook County, Illinois, USA, at Calvary Cemetery. Lot 40, Block 10, Section N.
[S378] John J. Headen, Headen, John J. Death Cert. Residence*: He resided at Chicago, Cook County, Illinois, USA, in 1930, at 6242 N. Greenview. 1930 Census Ed 1885, Reel 493, Page 18B (Stamped 219). Death*: Leo died on 19 October 1948 at Chicago, Cook County, Illinois, USA, at age 69. From the Illinois Statewide Death Index, 1916-1950. Certificate # 0029916. Headen -- Leo B. Headen, husband of Charlotte V. McGroh (sic), father of Charlotte McGovern, Patricia Lamy, Robert L., and Francis F. (E.? 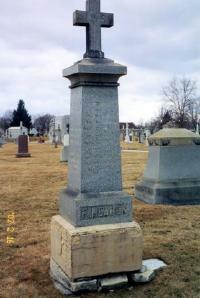 ), brother of Nan Garver. Funeral Friday, October 22, at 9:30 a.m., from funeral home, 1359 Devon avenue, at Glenwood, to St. Gertrude's. church , and All Saints cemetery. Baptism: She was baptized at St. Mary's Church, Evanston, Cook County, Illinois, USA, on 5 July 1885. Religion: Roman Catholic. St. Mary's Baptismal Register, page 13. Godparents: John A. O'Brien and Ellin McCanna..
[S1421] Cook County, Illinois Marriage Index, 1871-1920, online Ancestry.com, Devlin - Headen marriage record, FHL MF# 1030459. [S2284] Mary Louise Devlin, Illinois birth certificate #35124, FamilySearch.org, accessed April 5, 2010 (October 15, 1917). Death*: Mary died on 1 July 1931 at 6242 Greenview Avenue, Chicago, Cook County, Illinois, USA, at age 55. Illinois Statewide Death Index, 1916-1950. Certificate # 6019509. Certificate: Residence: 6242 Greenview Ave., Chicago; Single, Date of Birth: April 12, 1876; Age 55 years, 2 months, 19 days; occupation: none; birthplace: Evanston, Illinois; Father Francis Headen, Prescott, Ontario, Canada; Mother: Bridget Connor, Evanston, Illinois; Informant: Robert Headen, 6242 Greenview, Chicago, Illinois; cause of death: chronic myocarditis (?) Burial: Calvary, Evanston, July 3, 1931. Headen -- Mary Agnes Headen, beloved daughter of the late Frank and agnes E. Headen, beloved sister of John J., the Rev. F. M. J., Leo B., Mrs.. Mabel Devlin, Mrs.. Katherine Debicke, Mrs. Nan Garver. Funeral from her brother's residence, 6242 Greenview av., Friday, July 3, at 9:30 a.m. to St. Gertrude's church. Interment Calvary. New York papers please copy. Burial*: Her body was interred on 3 July 1931 at Evanston, Cook County, Illinois, USA, at Calvary Cemetery. Chicago Daily News, July 1, 1931, Page 38. Headen, Mary Agnes Headen, beloved daughter of the late Frank and Agnes E. Headen, beloved sister of John J., the Rev. F. M. J., Leo B., Mrs. Mabel Devlin, Mrs. Katherine Debicke, Mrs. Nan Garvey(r?). Funeral from her brother's residence, 5242 Greenview Av. Friday, July 3 at 9:30 a.m. to St. Gertrude's Church. Interment Calvary. New York papers please copy. Birth*: Patricia was born. See George P. Headen obit..